The development of the port of Liverpool owes much to the geographical situation of Bidston Hill. Ships approaching the Mersey estuary had to negotiate narrow channels between shifting sand banks, and the merchants of Liverpool had little notice of their arrival. Bidston Hill, being in sight both of approaching shipping and the docks of Liverpool, provided the ideal location for a lighthouse (solving the navigational problem) and a signals station (solving the communications problem). In 1763, four lighthouses were constructed in Wirral, two at Mockbeggar Wharf, and two at Hoylake. The Mockbeggar Lights, or “Sea Lights”, were leading lights that marked the safe passage through the Horse Channel. The “Lake Lights” marked the approach to a deep water mooring in the Dee Estuary called Hoyle Lake, from which the village of Hoylake took its name. It is no accident that the four lights were built so quickly. The previous year, an Act of Parliament had been passed empowering Liverpool to build lighthouses and levy light dues. They were allowed to borrow against future revenues from light dues to build the lighthouses, but they could not start charging light dues until a minimum of four lighthouses were operational. During the 1760s, William Hutchinson, then Liverpool Harbour Master and a former privateer, was experimenting at the signals station on Bidston Hill. He was able to boost the visibility of a lamp to unprecedented distances by placing it at the focus of a parabolic reflector. 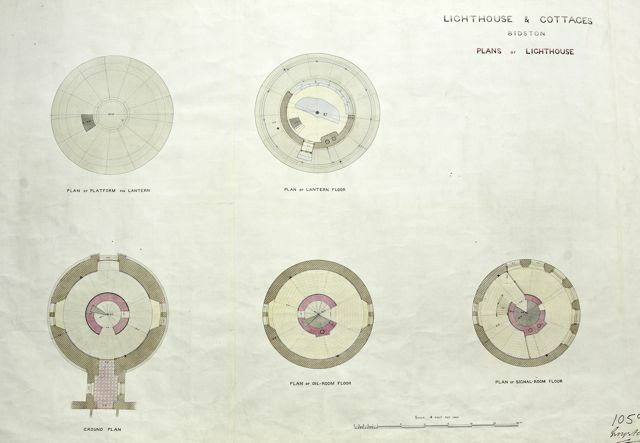 These catoptric lights were to revolutionise lighthouse optics. When in 1769 the lower lighthouse at Mockbeggar Wharf collapsed into the sea, instead of building another lighthouse in the same place (and risk it being washed away), it was decided to build a new lighthouse further back in the same alignment. Bidston Hill provided the right location. Being in line with the Horse Channel and the remaining Mockbeggar Light at Leasowe, a new lighthouse by the signals station could take over as the rear sea light. Its elevated situation meant that a smaller, and cheaper, tower could be built, away from the ravages of the sea. And most importantly, Hutchinson’s invention meant that Bidston’s light would be visible at the full range permitted by its 228′ elevation above high water: 21 nautical miles from the deck of a ship. The first Bidston Lighthouse was built in 1771. It had an octagonal tower, and featured one of Hutchinson’s parabolic reflectors. This was a massive object, fully 13’6″ in diameter, according to Robert Stevenson, who visited in 1801, or perhaps it was only 12′ across, as reported by Hutchinson himself (perhaps Stevenson included the width of the frame in his measurement, and Hutchinson did not). Bidston’s reflector was probably the largest of its kind ever deployed in a lighthouse. It was soon found that an equivalent illumination could be had by carefully aligning several smaller reflectors, using significantly less oil. After the original lighthouse was damaged by fire in 1865, the Mersey Docks and Harbour Corporation commissioned a new building to continue the functions of both the lighthouse and telegraph stations. Designed in 1872 by George Fosbery Lyster, the present lighthouse and cottages were completed in 1873, at a budget of £970 for the tower, £1475 for keepers’ accommodation, £1600 for the lamp, and £250 for the panoramic glazing. The cottages provided ample accommodation for three keepers (two with families), and were connected to each other and to the lighthouse through a common hallway, so that every keeper had access to the lighthouse without leaving the building, and each had his own porch and front door. 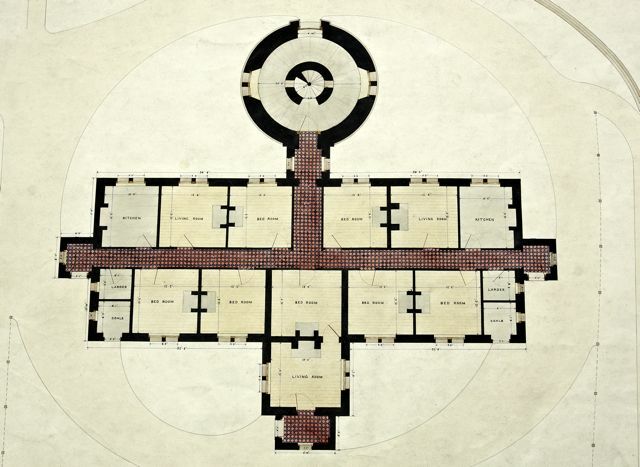 The hallway was lined with Ruabon tiles, and featured skylights along its long (north-south) axis. 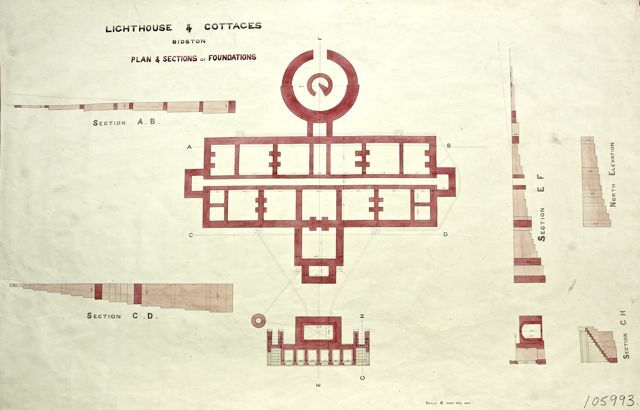 These drawings of the proposed Bidston Lighthouse and Cottages were made in 1872 by the Mersey Docks and Harbour Board. The building was completed in 1873. Innovations in communications (notably the electric telegraph) eventually made the Bidston Signals and the Liverpool to Holyhead optical telegraph obsolete. The demise of the Wirral lighthouses was due to changes in Liverpool Bay itself, caused by silt from the Mersey and Dee estuaries. By the late 19th century, Hoyle Lake had shrunk, and the Horse Channel was barely navigable. The Sea Lights no longer provided a useful leading line. Leasowe’s light was extinguished on 5th July, 1908. Bidston shone alone for another 5 years, finally ceasing operation in 1913, on 9th October, at sunrise. Navigational buoys and lightships, which had the advantage of being moveable, continued to provide useful service to mariners. In 1935, ownership passed to the Birkenhead Corporation, who used the cottages for accommodation. Several developments during the post-war period affected the character of the building. Electric lighting replaced gas in 1959. During the 1970s, an internal wall was erected, bisecting the smallest (Number 2) of the three cottages. The porch of Number 2 became a pair of external storage rooms, and allocated to the remaining cottages. Likewise, the living room of Number 2 became a pair of bathrooms, and the bedroom became a pair of utility rooms. The utility rooms now lacked any natural lighting, as the original skylights had been covered over by roof slates. Access between the remaining cottages and the lighthouse was now closed off. In 1974, Birkenhead Corporation leased the Lighthouse gardens to the Natural Environment Research Council (NERC) on a 99 year lease, effective from 1 June 1973. The Joseph Proudman Building was constructed here, and opened in 1979. In 1981, Wirral Borough Council (the successors of the Birkenhead Corporation), sold the building to the NERC. Number 1 Lighthouse Cottages continued as the residence of the Connell family. Number 3 Lighthouse Cottages was used as offices for staff of the NERC-funded Proudman Oceanographic Laboratory (POL), who by now had outgrown the adjacent Bidston Observatory. NERC used the Lighthouse tower as storage space. In December 1989, the Lighthouse and Cottages, the Observatory, and wall around the perimeter of the site all became Grade-II listed buildings. During the NERC occupancy, much expensive electronic equipment – computers, printers, networks, and so on – was installed in Number 3 Lighthouse Cottages. As the office was in a rather remote location and was generally occupied only during office hours, security became a paramount concern. This led to various alterations, such as the replacement of glass by unbreakable Perspex in all the windows, secondary sheets of Perspex being fitted to the window frames, the installation of metal shutters on the interior of every window, the cladding of the front door with sheet metal, a proliferation of alarm systems, and even barbed wire on the flat roofs covering the porches and the hallway between cottages and lighthouse. It is not known when the fireplaces of Number 3 were bricked up, nor when the octagonal flat-topped chimney pots were removed, and the chimneys cemented over. The lighthouse tower itself has been little used since 1913, apart from occasional uses as storage, as a training area for sea cadets, and by ham-radio enthusiasts. An injection of heritage lottery funds in 2000 brought some much needed repairs. An agreement (since terminated) between NERC and Wirral Borough Council led to the opening of the lighthouse to the public on several occasions in the early years of the new millennium. POL relocated from the Bidston Hill site to a new building at the University of Liverpool in 2004. Around this time, Mary Connell, a resident of the Lighthouse Cottages since the 1930’s, won a protracted legal battle to exercise her right to buy Number 1 Lighthouse Cottages, which then had to be converted to a separate title to allow the sale to proceed. Number 3 Lighthouse Cottages was occupied by live-in guardians for a few years, then put on the open market in 2010 along with the Lighthouse tower, and the sale completed in May 2011. Later that year, the present owners applied successfully to change the use of Number 3 Lighthouse Cottages back to residential. 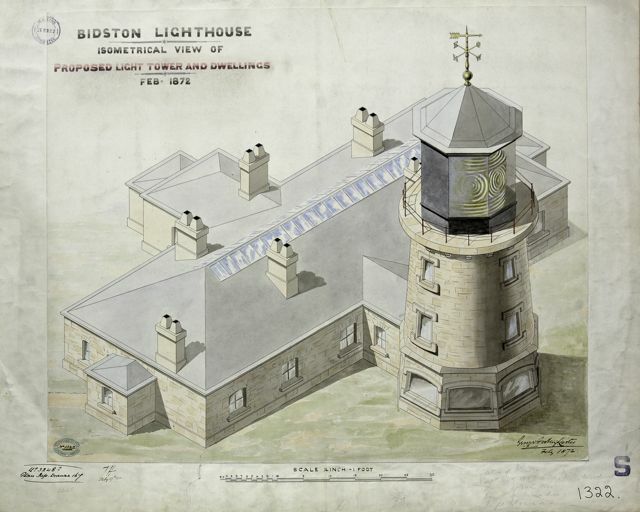 Bidston Lighthouse C.I.C. was formed in 2015. It is a not-for-profit, community-interest company dedicated to preserving Bidston Lighthouse and celebrating its important role in the development of telecommunications, lighthouse optics and the Port of Liverpool.